Pharma Maac is proud to announce a new product in our market. Another pearl of the Orthomol Pallet – Orthomol Femin. 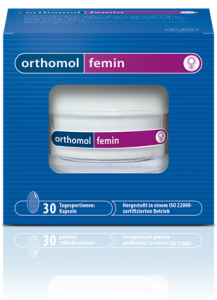 Orthomol Femin is a food supplement for women during the menopause and contains important nutrients for the skin, hair and nails. With biotin for the maintenance of normal skin and hair, and selenium for the maintenance of normal nails. Orthomol Femin is a well tolerated product, significantly reduces menopausal symptoms, and in this way improves the quality of life.